Exped Travel Wedge I Bug Net. Super light 1 person travel mosquito net! 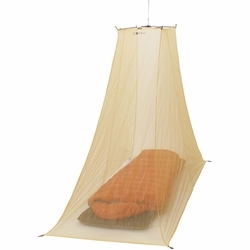 The tiny packed size and the ultra fine mesh make it perfect for travel use when sleeping indoors in the tropics or other mosquito infested areas. Two crossed poles in the roof increase interior space and the yellow mesh offers good color contrast to check if bugs got caught within the net. Various loops allow the net to be anchored to the bed.